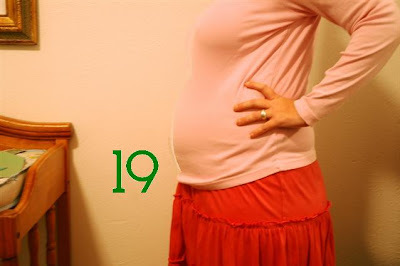 Here I am at 19 weeks. Get a load of my pink skirt. I tell you what, it's gonna be with me in the hereafter I just know it. Just a couple days ago at church I was asked, "Are you disappointed that you aren't showing yet?" If this isn't "showing" then tell me what is making my stomach distend? Hunger? "I have full empathy for you my darling!" "Right back at you Babe!"